It's Wednesday evening as I'm writing this. Hope Spoken ended on Sunday a little before noon. I don't feel fully prepared to share about this past weekend, but at the same time feel like I have to. I can't not write it down, with it being so fresh in my every thought and prayer. I am not really a conference girl. Which is funny, right? As I set out to plan a conference with my two beloved friends. We wanted to create something different, something meaningful, vulnerable, and safe. Our hearts were there, and we prayed that women would create that atmosphere in this place. As much as we wanted to, we couldn't create that on our own. Only the Lord working in these women's hearts could. From that very first minute that these precious women arrived, He did, they did. The women at Hope Spoken arrived ready and open to receive all that the Lord has for them. I can't put into words what that means to me. Shannan, whom I have loved and admired for so longed, shared this with me. (I can't quote her word for word but here's the gist...) She knew, and saw our hearts, for what we wanted this weekend to be. But she wasn't sure if what we wanted could actually happen. Not a thing against us, but could a weekend like that really exist? And, when it was all over, she told me it did happen. What we longed for, the Lord honored, and He created this beautiful, sacred place. The whole weekend, I couldn't help but thinking that this is what Heaven was going to feel like. I have never, in my life, felt that God had me where he wants me more than I felt this past weekend. He wants me in this community, and serving this way. It is a surreal feeling. I left feeling so incredibly filled up, but so incredibly broken to leave that space, not wanting to ever lose sight of what just happened there. Lauren Chandler closed our last morning together at Hope Spoken, after her was our last set of worship. I was so incredibly overwhelmed with the Holy Spirit that I literally have no idea what I said when I got up on stage, sobbing. Casey, Emily, and I went into this weekend wanting to bless women, wanting them to feel His love and direction in their stories. We left feeling like these women did that for US. Jordan and Lauren blessed us with worship twice throughout the weekend and sang this song, which I had never heard until then. I simply cannot stop listening to it, I have probably listened 105 times today, repeatedly going back and singing over this verse. It's at 1:37 in the video, I know cause I keep going back to it and crying it out. It is my prayer. It is my heart's cry. Also, I need a moment of silence for how amazing Jordan and Lauren were. They led us in worship in the most beautiful way. I can't stop thinking about it. 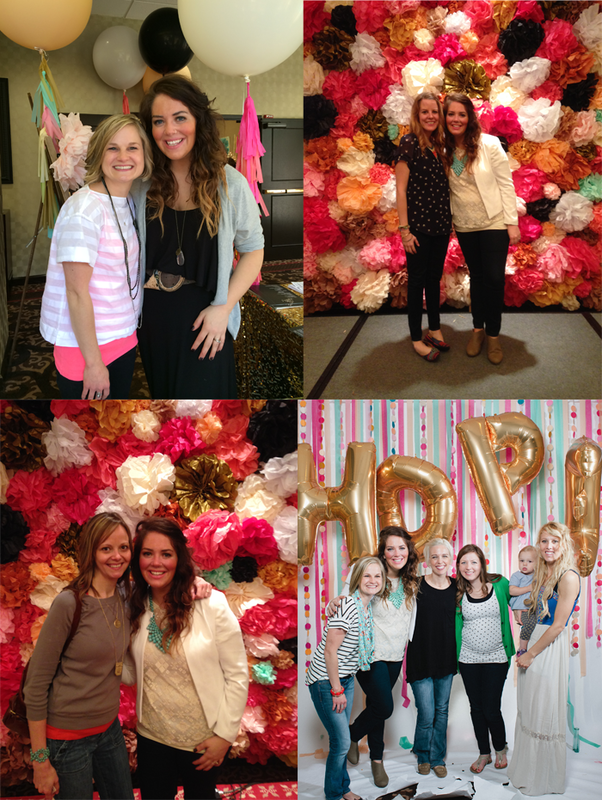 Each and every one of our speakers blessed these women at Hope Spoken. I watched as women came out the speaker sessions and listened to them, laughing, crying, or just watched them... thinking. We all have the common thread of needing the grace and redemption that only Jesus can give. Our stories look different but feel the same. The connections made here were priceless. If ever there was time that I felt free in the Lord, and what He is doing in my life, it was then. Planning and hosting the event alongside my soul sisters, Casey and Emily, was more than a gift. I can't put into words how much they mean to me and how honored I am to walk beside them. Meeting women like Cory, Lesley, Ashley, Wynne, Jess, Shannan, and so many others that I have loved for so long. Meeting women for the first time, and being abundantly blessed by the peeks into their hearts and their lives. New friends, and old friends. Shauna Niequist and Lauren Chandler rocking my world with their talks. Tim Halperin opening us in worship and setting the tone for the whole weekend. I could go on and on. I am going to share, over the next few weeks, more of what I am feeling, and processing, and some of what YOU are sharing with me about Hope Spoken. Remind me of this, if I forget my blog. Remind me to write it all out, as to not lose those words. I've heard nothing but great things about Hope Spoken and hope to someday experience it for myself. It's such a joy to know that God moved so powerfully amongst you awesome ladies! I look forward to reading more about your experience and everyone else's. looking at instagrams-- reading blog posts-- i so wished i was there but i felt-- in a weird way-- to feel like i was a part of it. i will be there next year. count on it. so excited for this-- for your vision-- christ's vision working through you. here's to more real, more broken, more true stories being shared. since africa the lord has told to be filled-- to be filled by him and to fill others-- and i see this so clearly in hope spoken. may you continue to fill others. It sounds like everything was pure God. All amazing. Needed. And wonderful. Praying my heart out that I can be there next year! Thank you for having such a gentle soul & sweet desire to serve women. Stop making me cry. Stop it. Just reading this post for the first time today. The Romans passage at the end is just what I needed. Came to work this morning to discover that my co-worker and friend lost her battle to cancer yesterday. And even though Cancer won the battle, my God has won the war. He is our glorious hope. i so wish i could have been there - hopefully next year :) i love reading your recap. praise the Lord for how He moves!! !